Something that can often be overlooked is glassware - they don't need to be left bare (ooh). A popular option includes decorating glasses with sugar. 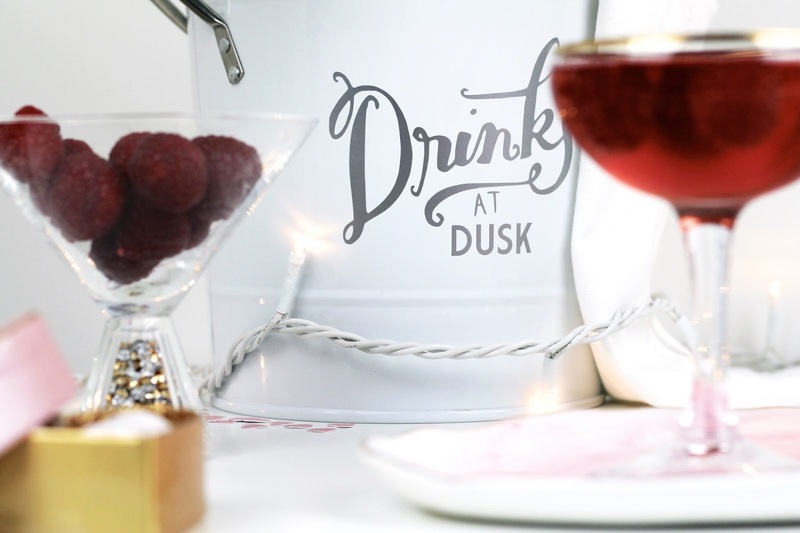 Alternatively, take a peek at my Glitter Rim Drink DIY from earlier this winter; it was created with the festive season in mind, though could easily transfer to romantic occasions. Anyway, choose your poison and then select a fruit to place within the glass, or to balance on the rim. 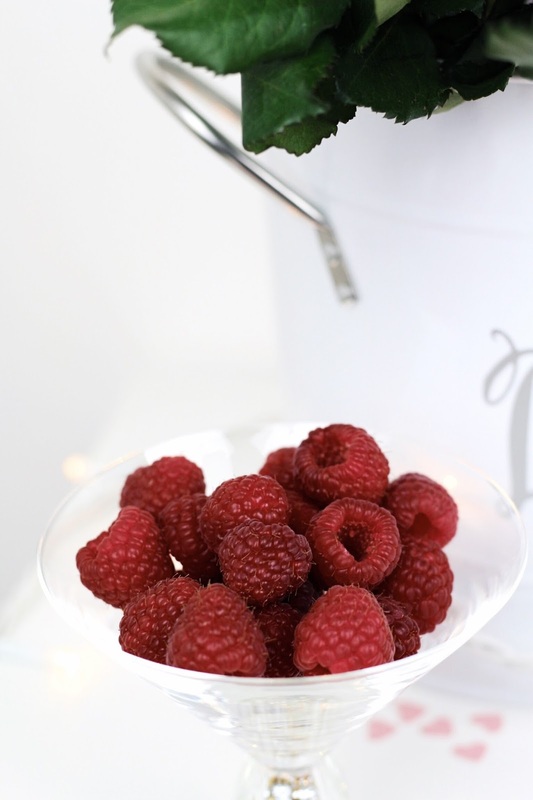 Strawberries have long been associated with Valentine's Day, though raspberries are just a little bit cuter, right? Continuing with the idea of 'embellishing' what you've already prepared, one of my favourite ways to create high impact with very little effort, is to place flowers within ice cubes. Pick a few small flower heads, place them in your ice cube tray covered with water and then freeze for four hours. If you plan on placing them in drinks, be sure to buy edible flowers to ensure nobody ends up coughing up petals! The Jonny's Sister personalised ice bucket shown in this post was a recent gift from a relative which I just love, I can't get over the pretty silver font! And the pink crockery shown is by Suite One Studio at Anthropologie, with their pastel-coloured, whimsical designs going a long way in setting a dreamy scene. I love any reason to celebrate and so the excuse to go totally crazy with heart shapes and sugary treats is a temptation I've never been able to resist! 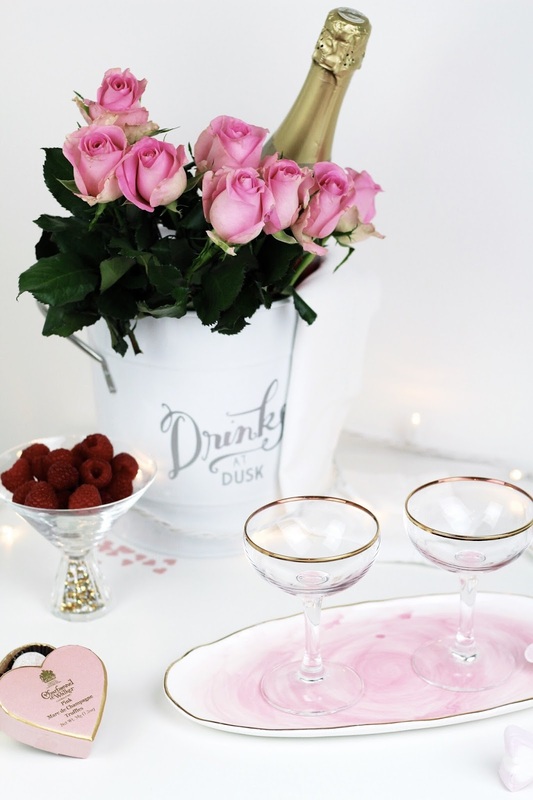 If you don't think your other half would appreciate the heart-shaped marshmallows and ahem, floral ice cubes, this could be a great reason to host a Galentine's Day celebration! Anyway, I'd love to hear your plans for February 14th? yum! love those champagne glasses! You have such creative ideas! I remember your sugar decor from Christmas post, it is totally appropriate for Vday as well, especially if we choose red colour with sugar. Those flowers in ice cubes are a fabulous idea as well. Fruits in drinks are a nice touch as well. Great Valentine's day inspiration! I love the idea of celebrating Valentine's day with friends. Some people don't celebrate it at all and that is fine but with all the commercialization around it, somehow it is not really possible to ignore it completely. So, why not celebrate it any way we want? I think it is a pretty good idea to celebrate it in non romantic ways, not just so that single people don't feel excluded but because we should take every opportunity to do sweet gestures for others. Why not use Valentine's day to buy presents from friends or make something cute for them? or organize a nice get together...or even organize a spa night for ourselves? Options are endless. Typically, I celebrate it with my significant other and as far as I can remember it is always a special day. I like to prepare a special meal on that day and I would much rather celebrate it at home because restaurants are so crowded on that day...and I don't like to be predictable. I eat in restaurants often enough, I don't need it for Valentine's day:)...but I guess everyone has their preferences. It is important that we decided what works best for us. Gabrielle, those glasses are truly beautiful. I love the addition of fruit to drinks :) So pretty. A very nice touch for Valentine's Day. I love the glasswear and pretty set up! My hubby and I don't do much since we spend a lot of time travelling, but we definitely love to have dinner together and a glass of wine from time to time and this is perfect! Oh my goodness, these glasses are absolutely stunning, what a subtle change but huge difference they make! These photos are absolutely beautiful, Gabrielle! 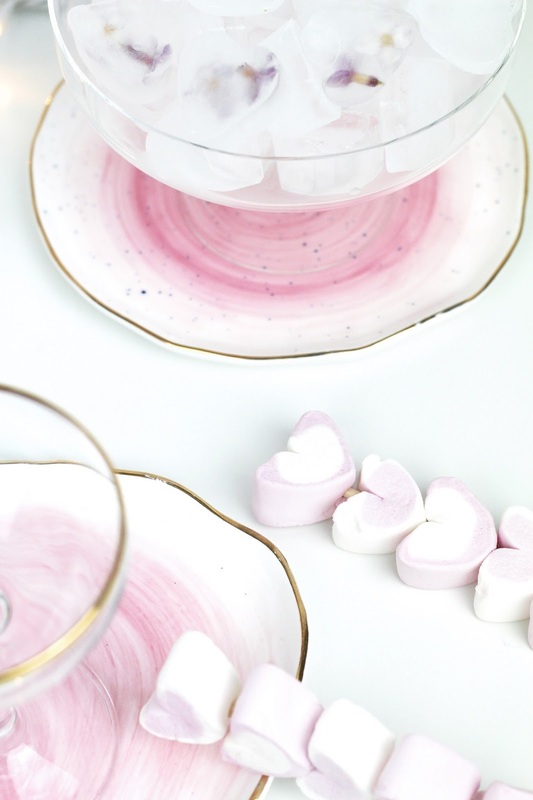 Those are the prettiest marshmallows I've ever seen and I can't get over the gold trimmed drinkware! Girl your photography just gets better and better with each post and when I think it can't get any better you still manage to make it better! The flower ice cubes are just the cutest and that's an idea I'll definitely be using! 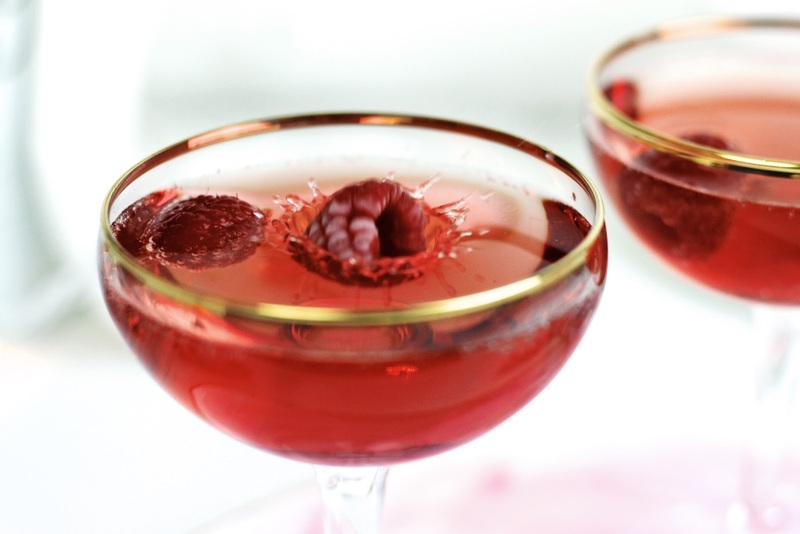 Love the champagne saucers, what a beautiful looking drink!! I refuse to celebrate Valentines Day, in my opinion it is all about making money, not about love and friendship. But each to their own, and your decorations are pretty enough dor any special night, be it alone, with a partner or with a group of friends. Love this setup , everything looks adorable, Gabrielle. I like that you chose raspberries instead of strawberries. Love these pictures! They're wonderful! Great ways to introduce valentines! Celebrating without a partner is totally acceptable! I love love love the photography! 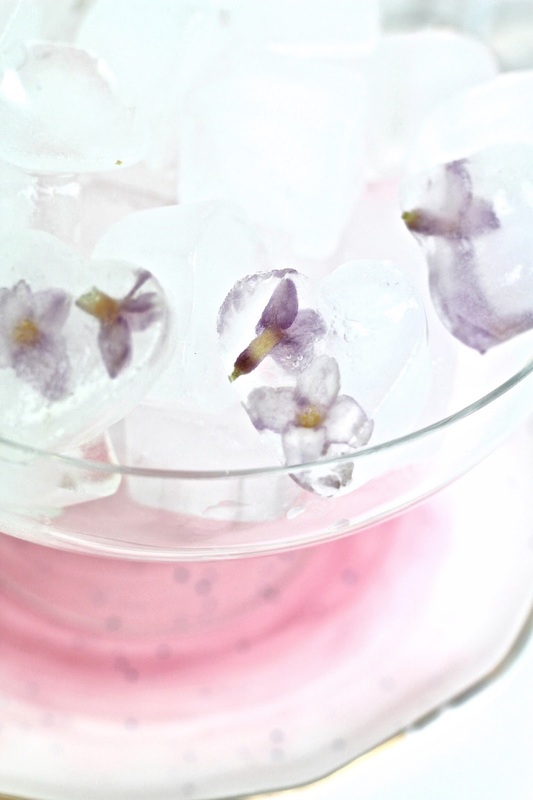 Great idea to put flowers in the ice cubes! 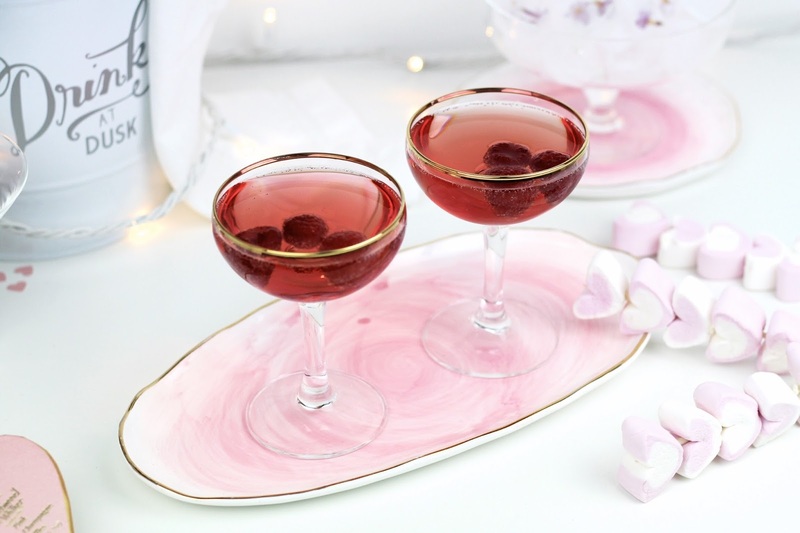 This Valentine's inspired post is lovely Gabrielle, great glassware and those cocktails look delicious! Really like the ice-cubes with the little florals in, a lovely touch! Great photographs as always, you're so talented! The ice cubes are such a good idea! Flowers are a great Valentine's day classic, so having them in your drink is really cute and unique. Of course, I'd open a bottle of pink champagne for the occasion :D The display you created is super pretty. For Valentine's day I'll be on Skype because my boyfriend lives in the other side of the world (how sad is that haha), but I'm planning on getting him a quirky Valentine's card - Clintons always has an amazing selection of cards! I have no plans whatsoever for Valentine's Day, but this is just so pretty, I have to at least set up a nice day for myself! I'll definitely use this as a guide. I hope your week is going well Gabrielle! flowers in the ice cube is such a nice touch! This is such an beautiful scene! I love that you managed to incorporate traditional aspects of Valentine's Day with classic elegance. Gorgeous! Everything looks so lovely on your photos!!! 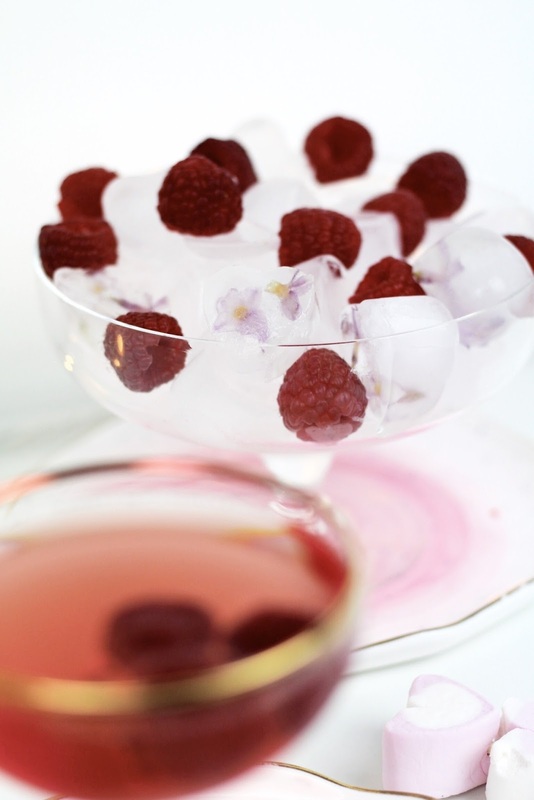 Great ideas to celebrate Valentine's Day in style - love the idea of the edible flowers in ice cubes, looks so pretty! I absolutely love your cocktail glasses!! My boyfriend and I don't have much planned for Valentine's Day but I'll probably head out to buy him chocolates during my lunch break today! Everything looks divine!! I loved the idea of the ice cubes, it's very delicate and nice! These pictures are gorgeous you're so creative they're lovely. I get so excited to spend Valentines Day with my boyfriend! I want a drink of that. Looks incredible. I don't have any V-Day plans, probably will spend it with some friends. When I get my own place in the future I can't wait to get pretty and fancy glassware and utensils, they make plain food look so much better and more fun to eat! Love the spread here AND the amazing photos! It is such a fancy glassware as well!!! I'm the same, I love any reason to celebrate, but actually I don't have any plans for Valentine's Day, yet. You've definitely done a great job of embellishing the scene, your pictures look amazing! This looks wonderful! I completely agree that people should have a great time at Valentine's Day regardless what their relationship status is. Hope you have a lovely weekend! I absolutely LOVE the idea of freezing edible flowers, it looks so beautiful! I remember the post you did with the glitter rim and it looked so beautiful, it's such a great idea for any festive occasion. 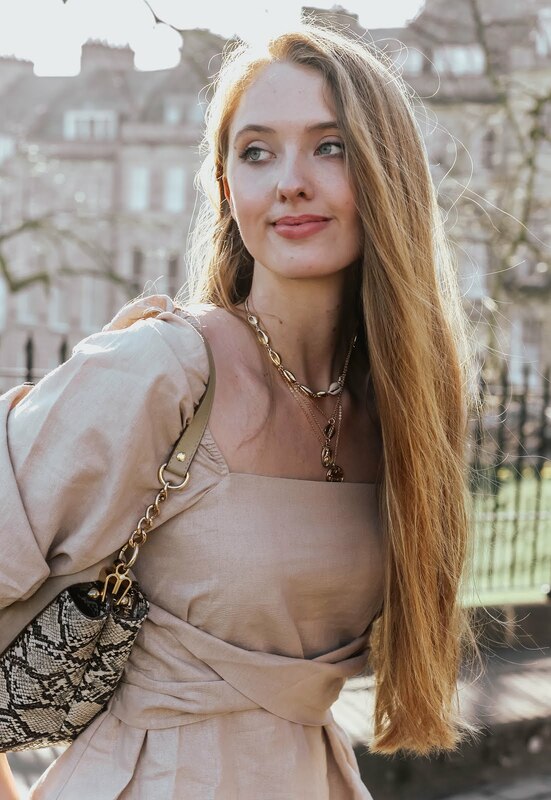 Thanks so much for sharing such lovely ideas on dressing up our drinks, though I won't be partaking this year :( I hope you have a wonderful weekend ahead, girlie! Omg I'm totally in love with the glasses !!! So delicate and elegant ! This is such a cute idea and much better to do something like this as a singleton rather than feeling sorry for yourself. Love, love, love the petal icecubes! Will definitely be doing something like this in the summer if not in the next couple of weeks.